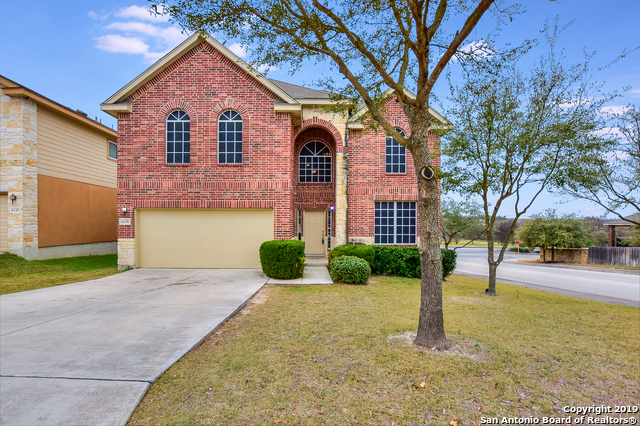 All THE HILLS AT ALAMO RANCH homes currently listed for sale in San Antonio as of 04/22/2019 are shown below. You can change the search criteria at any time by pressing the 'Change Search' button below. "13K BELOW APPRAISAL!! BEAUTIFUL CORNER LOT HOME W/4 BEDRMS & MASTER DOWN, 2.5 BATHS, 3-CAR GARAGE WITH EPOXY FLOOR, LOFT STORAGE AND AC. CHECK OUT THE GORGEOUS HAND-SCRAPED HARDWOOD FLOORS, LARGE COVERED PATIO, OUTDOOR KITCHEN, PERGOLA, SHED, BEAUTIFUL LANDSCAPING, STONE PATHWAYS, SPRINKLER SYSTEM, RV PARKING, BAY WINDOW IN MASTER & BEAUTIFUL TILE THROUGHOUT. THE GOURMET-STYLE KITCHEN FEATURES A LARGE BREAKFAST BAR & OVERSIZED ISLAND, GRANITE COUNTERTOPS, STAINLESS APPLIANCES & CUSTOM J-CRAFT CA"
"NEW INTERIOR PAINT AND CARPET 04/03/19! NEW SOLAR PANELS! Large open concept plan w/ gorgeous stone interior downstairs. Kitchen boasts plenty of cabinet space w/ granite counters, great for entertaining. Beautiful backyard deck ready for your outdoor living lifestyle. Northside ISD. Near popular Alamo Ranch shopping center w/ plenty of entertainment and restaurants. Approx 4 min to HEB Grocery. May qualify for USDA ZERO DOWN home loan!" "Timeless Design! Master Down , located on a corner lot. Over $30K in upgrades to include 18 tile in all downstairs living areas, except MB. Gorgeous designer colors, 2 faux wood blinds throughout. Granite counters w/42 cabinets, gas stove,tile backsplash,stainless appliances. Water softner w/dual filtration. Each BR has walk-in closets. Huge gameroom up overlooks downstairs. Awesome view from back deck w/full sprinkler system."